My goal as a cheese maker is to make delicious cheese for all of my friends, including those who can’t eat dairy due to severe allergies or chronic veganism. Let’s start cashew yogurt. Blend together cashews and almond milk. Put next to oven light for heat. 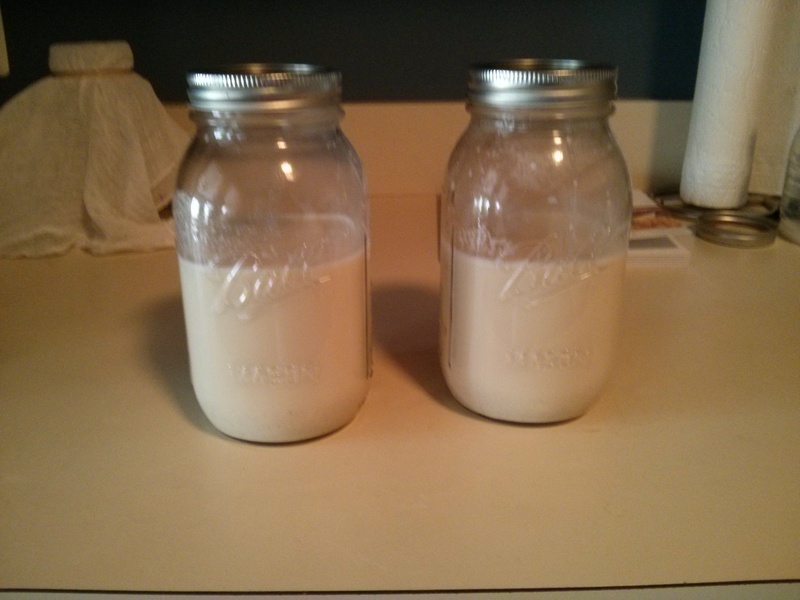 Cashew yogurt seems pretty easy. Just mix together the cashews and almond milk, add heat, culture with existing yogurt and then leave somewhere warm for a few hours. If you leave the yogurt in the oven for too long, and then forget to refrigerate overnight the yogurt will separate. 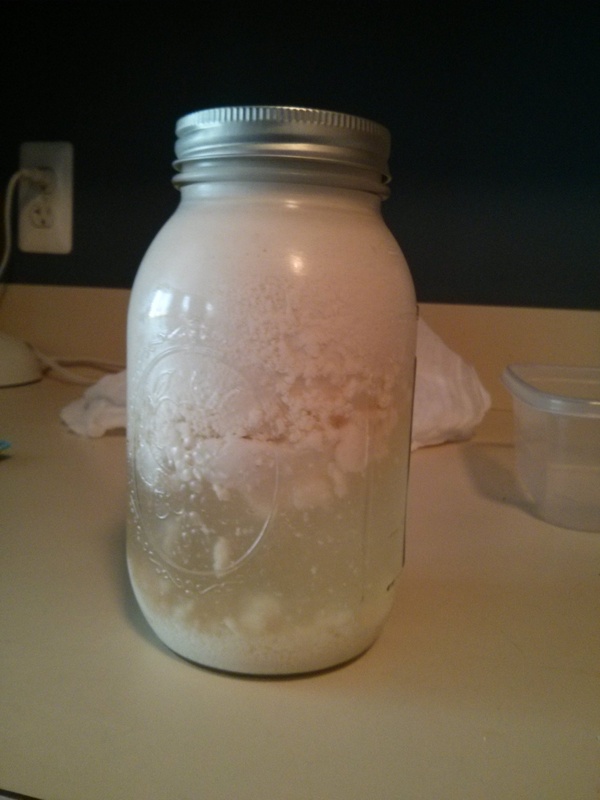 If you leave the cashew yogurt in the oven too long, and then forget to refrigerate overnight you get this. Soak the cashews before blending, otherwise they won’t blend completely. So let’s reread the recipe and try again. My first mistake: I didn’t soak the cashews in water to soften them before blending. Also, soy milk is recommended over almond milk for making cheese. So I made these changes and left the yogurt in the oven for a little less time. The result was a little thin, but actually looked and smelled like yogurt! Cashews are soaked in water to make them easier to grind up in the blender. I soaked these for about 4 hours, and I still noticed some cashew flakes floating around in the end. 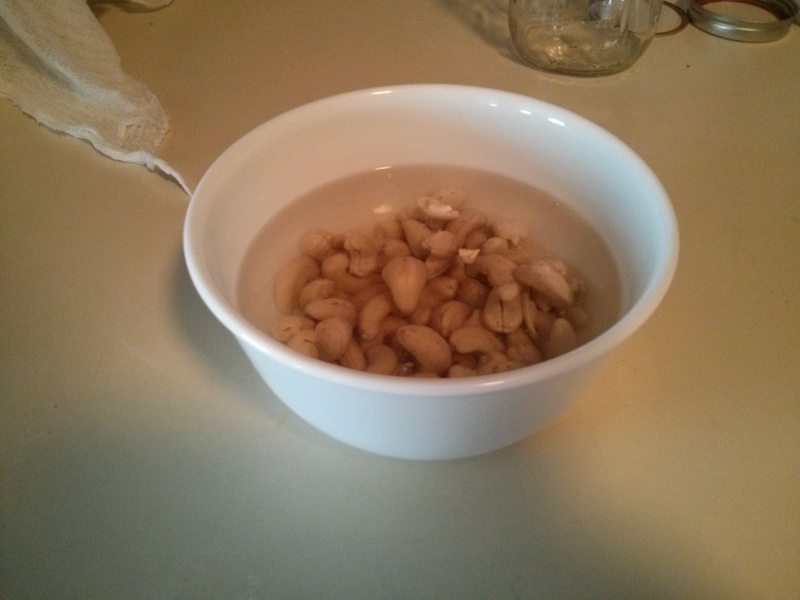 Next time: soak cashews longer. I used cultured coconut milk as my yogurt starter. This might have led to some problem getting the yogurt to thicken. Next time: use either soy yogurt as the starter or find a vegetarian yogurt culture packet. I left the yogurt in the oven for about 6 hours to firm up, which may also have led to my thickening problems. Next time: leave the yogurt near the light for the full 8 hours. It occurs to me that I’ve been full-time for a little over a year now, so it’s time I shared the story of how I decided to switch over to living as Anna 100% of the time. I had a plan for my transition from the beginning. I started hormone therapy in April 2013, and I wanted to give the hormones time to work before going public. The plan was to make an announcement at work right before leaving for the Christmas holidays, giving my coworkers a couple of weeks to let the news sink in. That was the plan … for about four months. I had a camping trip with some friends that August. In the weeks leading up to it I managed to convince myself that I should spend the entire weekend as Anna to get some experience around other people. I had a lot of fun that weekend! I got over my initial fears on the first day, and some of the people I met that weekend had no idea that I’m trans. That camping trip was a huge confidence boost for me, but it came with a side effect: I didn’t want to go back to a life where I had to pretend to be male. I delayed as long as I could, but I eventually had to go back to work. My mental state started falling apart during my walk to downtown, and I ended up complaining to a group of friends that all my male clothes were big, baggy, and uncomfortable. The day got worse from there. I was just beginning to bring my attention to my work again when a group of people returned from lunch and greeted me with a friendly “Hey Bryan, how was your weekend?”. This was an innocent question, and in any other context would have been fine. Unfortunately, the reminder that the camping trip was over and I was back to presenting male felt like a huge slap in the face. I spent the next hour trying really hard not to cry at my desk in front of everybody. Later that day one of my friends pointed out that if presenting male was causing me problems, then why continue doing it? The idea of switching to “Anna-mode” publicly and permanently made a lot of sense but it scared me at the same time. Was I ready for full-time so soon? What about my plan? By the end of the day I had decided that relying on “the plan” was just a stalling tactic, and that I really needed to make a change for my sanity. So I talked to my friends, I emailed my coworkers and by the end of the week I was full-time! I haven’t regretted my decision one bit. This past year was absolutely fantastic, and I’ve had a lot of fun. I want to give a huge THANK YOU to all the people in my life who are there for me. The whole transition process would have been way scarier if I didn’t have your friendship and support through all of it. Here’s to year two!